It's Free to join and you earn points every time you shop with us. Everyday rewards are given when you reach certain milestones! Reach VIP status and earn 2X the points on your purchases! Manage your rewards via a mobile link sent to you when you sign up! The Cambridge Rewards program is intended for personal use only. Commercial use is prohibited. This program is not targeted towards, nor intended for use by, anyone under the age of 21. There are no membership fees associated with Cambridge Rewards. Points accumulated under the program are promotional and have no cash value. 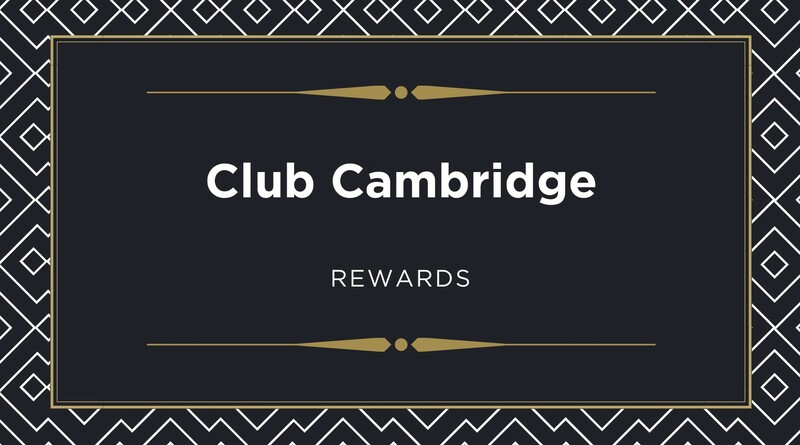 Your rewards and your account under Club Cambridge Rewards are personal to you and may not be sold, transferred or assigned to, or shared with, family, friends or others, or used by you for any commercial purpose. You may have only one (1) Club Cambridge Rewards account that is personal to you. Cambridge Wines reserves the right to terminate, discontinue, cancel or change the rewards program at any time and in its sole discretion without notice to you. Due to New Jersey State Law no product may be sold below "cost". In order to redeem your points, each transaction must abide by NJ ABC regulations and state law. At the point of sale, Cambridge Wines reserves the right to deny the use of rewards if the transaction does not follow ABC regulation and laws. Points earned through transactions online may only be redeemed for "in-store" purchases. Only one reward may be used at a time. Offers may not be combined. Offers are not valid on items "everyday sale" items or product deemed "non discountable".